Something in seeing this cover surprised me that it’s "only" #3. This also seems ripe to be the right-half of a 2-part image, with whoever is blasting Prototype on the other side…but alas, this is a Rune Month issue with a flip cover (no wraparound). On the plus side, I’m not aware of any VARIANT covers, so this is simply THE cover for #3! We open on Jimmy (Prototype) and his handler stuck on a plane–their flight’s been delayed. As they wait, terrorists calling themselves Terrordyne, Inc. attack another plane with a baseball team on board. Jimmy’s excited at the prospect of some action; meanwhile, we get a scene with someone in shadows on the phone turning down an offer, before leaping into some sort of action, gun blazing. As another subplot, we get a page with a lab and a revelation that Glare’s body (the Ultra that apparently died at Prototype’s hands in #1) shows he’s got wetware implants, and the body will be shipped off to Aladdin for analysis. As Jimmy suits up, and reveals that he’s disabled a shutdown failsafe in his armor, we cut to Bob Campbell explaining what happened to lead him showing up at his ex’s place in such horrid condition; as she patches him up, he reminisces about their past, providing us plenty of exposition. From there we get to the "meat" of the story as Prototype stops the terrorists, only to then face their leader: someone with flame powers calling himself Heater. The Prototype armor shorts out–Jimmy suspects it might be from his tinkering–but he gets the auxiliary power going in time to survive. His handler is tossed out of the plane (when did it take off? ), so Jimmy opts to save him, figuring he can catch the villain after…but by the time the get back to the ground, Heater’s vanished. In frustration, he blasts the corporate jet out of the sky (the pilot had already been killed). This, as well as the earlier scuffle and the Prime incident (see Prime #4) has Leland–Ultratech’s president–more than fed up with the young "hero." As he asks for interviews to begin on a replacement, we cut to someone called Wrath being brought in on a plan of industrial espionage and heading out after Prototype. Starting with the end of the issue…we have a page marked as "25" but it has no captioning, dialogue, etc…and with plenty of open space at the top and bottom, looks like a cover image thrown into an issue. If it wasn’t numbered to appear to be a story page, it’d look like basically an ad for the next issue or such! 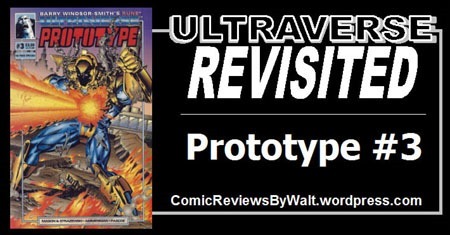 I continue to feel (mostly pleasantly) like there’s almost too much going on in a given Ultraverse comic…they’re much denser than modern 2018 comics, with a lot more story and development packed into a single issue! I’m definitely enjoying that we’re getting a story of not only the new/current Prototype, Jimmy Ruiz, but also the original–Bob Campbell. And rather than only piecing something together issues later in denouement at the end of a multi-issue arc, we get cut scenes to other characters and stuff going on simultaneous with the main story…stuff going on that we as readers get to actually see developing instead of being told (after the fact) did happen, later. Jimmy’s a hothead, and that comes off with his impetuousness at the start of the issue–eager for battle, even though it means there are people getting hurt. Still, he wants to be the hero he’s playing–for real, not just looking good for cameras. I know Wrath as an Ultraverse title, though that title’s logo is not this initial WRATH logo on the final page with the character Wrath. I don’t think I realized that he came out of Prototype, but definitely like that the title apparently was a spinoff (though I’ll get to that in awhile when I get to the 1994 books!). The art is solid and gets things across as any art should do. The only point I found myself not entirely clear what had happened was when Prototype blasts Heater…there’s an impact, but also an exclamation balloon of "YARGH!" nowhere hear Heater’s mouth, actually looking like he might’ve taken the worst of the blast below the belt…or that something was positioned in the wrong part of the panel…presumably definitely something with the infamous computer design stuff Malibu had going on. Otherwise, the issue looks good–especially Prototype. I still really dig the look, even if it is very ’90s! Picking up shortly after the previous chapter (in Freex #4), where we were left to assume Rune killed Edwin, here we get visual confirmation that he definitely did–with exposed rib bones and reddish coloring to suggest the gore. Edwin–briefly–was the most powerful being on the planet, according to "previously" text, but Rune killed him…and now imbued with his power, has filled out, transforming back to a younger, vital self. Moments later, though, his body reverts back to the frail, sickly creature he’s become, and he realizes that even this was not enough. I thought Rune was a vampire…if not 100% typical, then at least using his fangs to leech life/bio-energy from his victims. Not physically consuming the bodies! A cannibalistic vampire, I guess? Whatever the case, the visuals add to the bloody violence of the thing, which seems fitting given Barry Windsor-Smith‘s other works (first in my mind being Conan and Weapon X). This chapter works pretty well in directly following the previous, yet a bit of time has passed. That makes for something choppy going page to page, but for being a new piece of the story in a separate publication than the previous piece, it’s little worse than any other "returning from a cliffhanger but some time has passed" instance. Though the cover seemed somewhat incomplete or generic-ish, I liked this issue. There’s a lot of story between the covers, and while there are only 25 story pages (as with the other titles, the cover proclaims the issue a 40 page special), this is still a very full issue with development and forward movement on multiple plot threads. 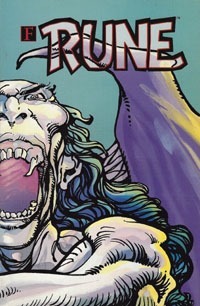 The Rune chapter is again not something to singularly "sell" the issue, but doesn’t detract. The segment moves that narrative forward, and I find myself looking toward getting more info about what Rune is, how he gets power from beings he consumes (does he absolutely have to consume their flesh or is that a ‘pleasure,’ for example?) and so on. I haven’t read the title in nearly two decades, so it’s like getting Rune fresh, and I don’t recall many particular details. Yet again, this issue isn’t something I’d recommend seeking out as a single issue in isolation…you’re better off with the #1 for that. But this is definitely worth picking up as part of a run, and in that context certainly worth 25 to 50 cents. Though its original cover price is $2.50, and this IS an "early Ultraverse" issue, I frequently see these in bargain bins, so it should be able to be found for $1 or less, and I wouldn’t go much above the $1 unless you’re ‘desperate’ for the issue in some form.